“Big Galut(e) is an ensemble we’ve wanted to present in Oak Ridge for quite some time. 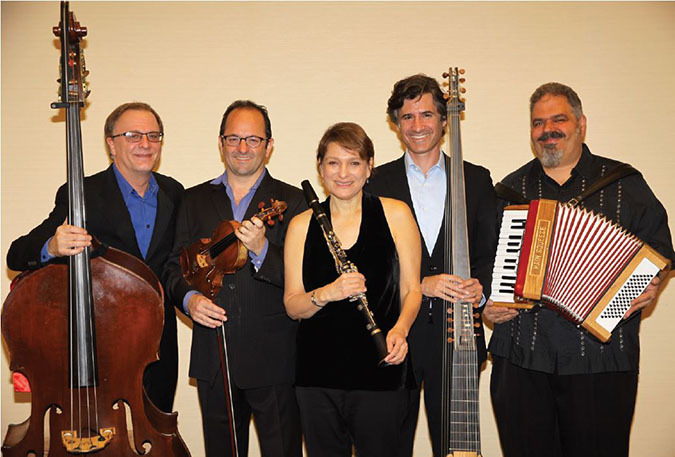 The five-member ensemble will wow listeners with a fascinating repertoire that includes Klezmer originals, tangos, Broadway, comical songs and more,” continued Schwenterly. The ensemble’s set list includes music by Gershwin, Shostakovich, and Rossi, and Sasha Margolis’ Wallachian-Appalachian Scratchin’ -- a mashup of bluegrass, Klezmer and Roma sounds. Clarinetist Robin Seletsky, violinist Sasha Margolis, lutist Michael Leopold, keyboardist and percussionist Mark Rubinstein, and double bassist Richard Sosinsky will also present a pre-concert talk beginning at 7:00 PM. Free with ticket purchase, the pre-concert talk will broaden audience members’ knowledge of the history and development of Klezmer music. As an added bonus, violinist Sasha Margolis will speak about his book, The Tsimbalist, on March 16, 12:00 PM, at the Jewish Congregation of Oak Ridge Beth El Center. Major funding for the concert is generously provided by Chuck & Nancy Coutant. Support for the 2018–2019 Oak Ridge Chamber Music Series is generously provided by the Feldman Family in memory of Cyrus and Rose Feldman. ORCMA gratefully acknowledges the Jewish Congregation of Oak Ridge for receptions and its support of ORCMA's programming. Pollard Auditorium is located at 210 Badger Road. JCOR Beth El Center is located at 101 W. Madison Lane. Information and tickets are available online at ORCMA.org, at office@orcma.org, or by calling 865-483-5569. Adult admission is $25, and Young Adult (ages 19-29) admission is $10. The Oak Ridge Civic Music Association is a proud participant of the Penny4Arts initiative, providing free admission to Youth 18 & Under to all ORCMA subscription concerts during the 2018–2019 season. Admission to the book discussion is free. Additional season support for the Oak Ridge Civic Music Association is provided by UT-Battelle/Oak Ridge National Laboratory, the Tennessee Arts Commission and WUOT FM 91.9.